Tip! Click on references as they appear in the text in order to see the full bibliographic records. Music is a Kunstart, in German as in Danish, literally: a ’species of art’. This biological analogy — a 'species' of art is imaged and conceptualized cognitively as a living being — may have inspired our general History of Art. The underlying intuition about these beaux arts, the ’beautiful arts’, may be a conceptual metaphor according to which BEAUTY IS LIFE; the kinds or types of aesthetic expression, thus conceptualized as animal species, ”Arten”, are maybe also seen as inscribed in a sort of genetic evolution. Anyway there is a basic, conceptual zero-to-positive grading scale, spanning from 'not beautiful' = 'not alive', to 'very beautiful' = 'very much alive'. Beauty is not just an ideological term, or an outdated norm, but is a real cross-cultural and transhistorical phenomenon , an experiential fact about the human mind, the one that motivates the genre of objective phenomenology we call art criticism. Art really does convey beauty. Art is in fact ’good’ when 'beauti-ful', and bad when not. As mentioned, good art is praised for being metaphorically ’alive’, and bad art is scorned for being ’dead’. Furthermore, it is a characteristic of the experience of art that this strange, bio-critical evaluation of its objective source, the work of art, is a part of its perception, rather than an estimation by external normative parameters. There is an aesthetic perception, an Einstellung (a mental attitude) which in this and other respects differs from a non-aesthetic' perception (of the same object), in which there is no such inherent critical evaluation. The evaluation of art therefore does not mainly depend on external, circumstantial criteria, as some modernist schools inspired by Marcel Duchamp and others have claimed, but is primarily determined by the specific internal content of an aesthetic perception of art. How the specific determination really works is not clear to critics, though; and they do not need to know it in order to judge perfectly well. But one of the tasks of neuro-aesthetic research will be to elucidate the nature of this evaluative issue. The determination might of course work differently in different sense modalities; so, musical beauty does not have to depend on exactly the same neural processes as, say, pictorial beauty. But we would still expect to see some important inter-aesthetic correlations. In so far, much of what I have to say about music should also be relevant to the study of other ’Kunstarten’. In history of art, it is non uncommon to distinguish the spatial arts (architecture, sculpture, painting…), which create material objects, and the temporal arts (music, dance, poetry and the narrative genres: drama, fiction, film, video…), which create immaterial objects. Their respective histories do not always unfold in parallel; but their anthropology seems to be much the same. So, whether material or immaterial, these artefactual objects we call works of art (Kunstwerke) tend to attract and affect us in comparable ways, namely either as means of celebration of culturally important events or as ’self-celebrating’ things, as activities important in themselves. Musical performances can hail a king, animate a military parade, accompany a theatrical declaration of love, be staged as spectacular social concert events, or be played in intimacy, as chamber music, for its own sake. All of our ’species’ of art use expressive signs that already serve evident functional purposes in social life as well as that of creating celebrative energy or pure beauty. And the arts are often functional conveyors of pragmatic information, or used in order to give performative force to events of communal interest, at the same time as they are sources of aesthetic pleasure. But works of art always additionally call attention to their own making, as to a manifestation of what artists used to and still call pure form, the structural organization of the expression as such, as something important in itself. These 'works' display an auto-referential insistence that makes them paradoxically into signs of themselves; the ’formalism’ in art as such is thus another feature that makes aesthetic perception different from pragmatic perception, and perhaps the most important feature. One of the tasks of neuro-aesthetics will be to find the mechanisms underlying this variation in perception from pragmatic to aesthetic and formal. As Susanne K. Langer suggested (Langer 1967/1972/1982 and Langer 1953), the aesthetic experience of form and the paradoxical feeling of the object being ’alive’ in good works of art may be interrelated and cognitively constitutive. Artfulness may cognitively ’animate’ the object and let us experience it as if it were a sort of autonomous and live creature, equipped with an autonomous consciousness, with mind and intentionality. As if it were an auto-referential biological organism, an embodied subject. This strange aesthetic feeling is extremely strong in experiences of music. Music is even sometimes said to ’breathe’. If architecture presides over the spatial arts, music probably presides over the temporal arts in human evolution, all the way from the Neolithic to the historical cultures of Cro-Magnon civilization. Architecture and music are both culturally primary. We must build, and we must ’sound’, in order to be a culture. Furthermore, the optical and the acoustic aspects of our creations are intimately related; they apparently integrate whenever and wherever we perform a socially significant act: our habitats must resound, and our musical displays must fill our spaces and ’take place’. Our embodied minds connect in optico-acoustic spaces, where the gestures of our bodies seek to attune to each other. The endevour for our minds to obtain intersubjective attunement, establish communicative contact in time and space, and to produce or perceive art and formal structures, are perhaps one and the same. In that case, beauty may be a significant evolutionary factor and its experience may be just the special quality ascribed to the phenomena that convey it, in particular the elaborate, ornamental artefacts or performances that make human minds admire and attune, admire while attuning. As I. Kant noticed (Kant 1790: Part I, Ch.1 §7), we say, impersonally: ”This [music] is beautiful…” (instead of, personally: ”I like it”). The aesthetic judgment is grammatically impersonal, and beauty is referred to as objectively given, probably because this ’feeling’, when it is present, is perceived as being shared by an indefinite number of minds as something that should — is justly supposed to, in principle — attune all of them. Accordingly, music — along with architecture — appears in the behavior of our species in relation to prominent elementary fields of shared social activity such as Work, Love, and Worship: work songs, love songs, and sacred hymns. Music and architecture are no doubt the two most important integrative semiotic practices in social life, besides language. And language would probably never be able to function without them. Brains specialize cognitively for space and for language, but also for music. These specializations are bodily grounded. If we accept, for a starter, to approach music through the classical triad of structures: rhythm, melody, harmony, we may consider these three acoustic substructures as cognitively embodied in three corresponding ways. Firstly, musical rhythms involving beats performed in recursive numerical series (called bars) allow muscular motor coordination in collective (multi-body) activities, e. g. of the sorts mentioned (Work, Love, Worship), and typically those involving locomotion (legs and posture). Humans count and move together. There probably exists a rather direct connection between dancing and temporal cognition — a connection that may involve symbolic representations of time as concentric calendar wheels and other inventions for capturing the idea of temporal ’slots’ that return regularly. Secondly, tonal sounds arranged in sequences of pitch variations, also called melodic lines, make it possible to guide the coordination of gestures, as in rituals and communicative interaction, typically those involving movement of hands and arms; people sing or chant and gesticulate together. Aspectual schemas of time perception (initiation, termination, duration, iteration etc.) may derive from this vocal coordination. Thirdly, the simultaneous use of different instruments, the 'orchestration' of combined sound sources and of maintained tonal clusters containing pitch intervals whose interfering formants produce consonance and dissonance, also called harmonic clusters, or chords, are directly related to our gestural, facial, and vocal expressions of mood and empathic disposition, cf. the double meaning of German ’Stimmung’ (mood, tuning). People purr, hum, sigh, moan, groan, grunt or screech, scream, yell, bawl, shout, squall, squeal etc. at each other and their faces configurate accordingly, when they mean to let each other know what their mood or emotion and their attitude to shared situations are. This variation is even most often automatic and only needs the subject’s conscious intervention when intentionally repeated, simulated, theatricalized, or quoted. Music addresses our body in these remarkably concrete and direct ways when heard. It may also be important to notice that when played, music appears to emanate from the body of the orchestra and the body of the musician, and thereby constitutes a significant metonymy for an embodied person, the 'persona' that musicians take on as a semi-fictional role while playing, or else a metonymy for the very person the musician is. We know from cognitive semantics as well as from classical rhetoric that metonymic presentations of things, and in particular of individuals, are perceived as far more pithy than their referents, and that if perceived as significative of a person, they are more strongly personalizing and even more 'vivid' than the person itself: they are the person’s signature. This particular identity- or authenticity-making effect of metonymy and metonymic compression of personhood in music may also explain the Langer-effect of vitalism in form perception. A style is a signature of some (numerical) identity. As to the corresponding activation in the brains of listeners and musicians, the processing (Cf. Zatorre et al. 2001) of tonal hearing and thinking appears to happen in specialized neuron groups in the superior temporal and some frontal regions of the cortex, particularly in the right side, but recent scanning studies (PET and fMRI) show additional bilateral activity in occipital areas normally involved in visual processing, despite the absence of visual input (Zatorre, Perry, Beckett, Westbury and Evans 1998). Also parts of motor cortex are activated. Furthermore, paralimbic areas that are active in emotional processing are shown to be involved in the evaluative aspects of musical experience. This suggests, among other things, that the auditory processing of music is integrated with spatio-visual imagery, as well as with something we could call imaginary motion or gesture and, correspondingly, with imaginary emotion. In the referred experimental situations, the input is exclusively acoustic, but it triggers in the listener’s mind a multimodal imaginary activity implying fantasized scenarios in time and space, landscapes and architectural sites, possibly with persons that move, gesticulate, and behave emotionally — virtual opera-like or rather film-like scenes of embodied intersubjectivity. Music thus appears, as suggested by C. Trevarthen (Trevarthen 2000), to guide our minds into communitary attitudes, to prepare us for cooperation and expressive exchange based on empathy, shared attention and volition — attitudes that we ’share’ with the imaginary musical gestalts and creatures themselves and then with each other. 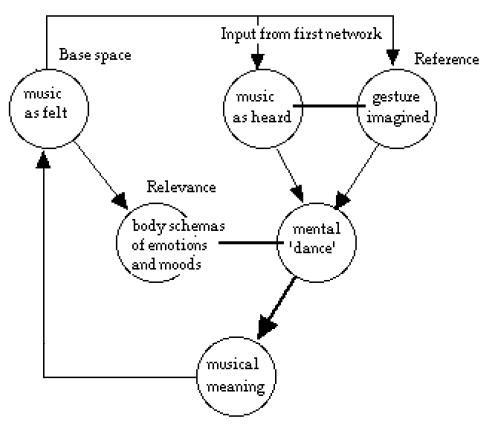 This imaginary aspect of musical hearing prepares our minds for a semantics of human interaction, in the sense that our imaginary gestures and imaginary emotional states are virtual feelings, contents that we can adopt or just consider as possible or adequate, not directly ’had’, felt: they are instances of Meaning. They possess imaginary, semiotic reality. What we experience when music is being performed, whether by others or by ourselves, is given immaterially but really, as a thought without a head, one that people including ourselves could have and are invited to have but do not have to have. ”Sad” music heard by us when we are already sad makes us more impersonally and communally sad: it makes us virtually share that mood with others, and it thus brings us comfort, even pleasure. Note that we easily ascribe emotional states to music ’itself’; why this happens is a deep neuro-aesthetic and semiotic question. The virtuality of meaning musically conveyed appears to enhance its communality. The neural ’imaginarization’ of visual space-time, motion, gesture, and facial expressions, as associated with musical thinking and hearing, makes these meanings of tonal experiences appear to us as separated from any individuals that might be factually having them here and now. As mentioned, they form autonomous gestalts or phantoms of 'possible people' of whose presence they would be metonymies. In this sense we might in fact as well speak about musical disembodiment, as a cognitively relevant phenomenon. I think it is probable that such a metonymically established disembodiment is an important prerequisite, if not the principal origin, of abstraction in general. Abstract (ownerless, just possible) ideas or forms are results of metonymic disembodiment; they are then readily re-embodied in architecture, sculpture, and imagery in general, when music is performed and experienced collectively in socio-cultural sites, settings, and scenarios – as the ’meaning of’ that site. We then get the genius loci effect: the place is felt as having a certain ’spirit’ attached to it. Here, meaning migrates musically from our bodies into architectural receptors in space. Individual re-embodiment of meaning subsequently occurs, mainly in the shape of experiences of participation in the resounding collective activities that the architectural spaces hence determine and contain. This happens when we play and thereby 'interpret' music. We then become fillers of the role of the 'genius loci' reembodied in the space of performance. By metonymy, our minds thus disembody and reembody, but the reembodiment produces a generalized, communal gestalt, a principled activity or active principle in the place of the original source body. The resounding expression is experienced as a sign of this principled entity. It is on the way to becoming an abstract symbol. In this sense, playing is inherently an act of symbolization. It disembodies and reembodies, performs a semiotic transformation from a body of flesh to a body of meaning. In what follows, I will present a technical version of this view of music and meaning in terms of conceptual integration and blending analysis, as developed by Mark Turner and Gilles Fauconnier, and then cast into a semiotic mould (Fauconnier and Turner 2002 and Brandt 2004). 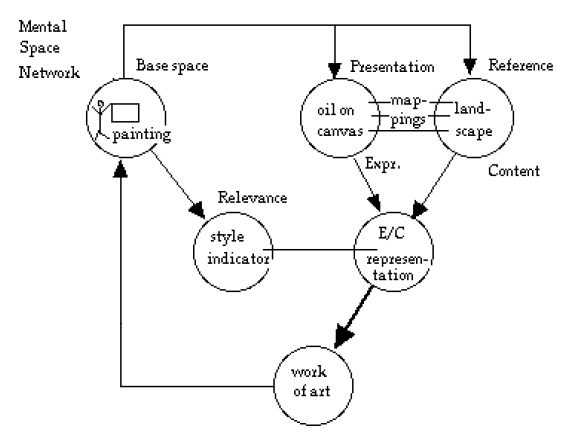 According to the model presented here, a conceptual blend is a semantic construction that has contents from two mental spaces as inputs, one Presentational, the other Referential; the blend of these input contents is stabilized by a binding process that ties and maps it to a dynamic cognitive schema appearing in a Relevance space. Let me give a simple preliminary example: a painting is seen both as a window into a theme — a landscape, a scene — and as a presentation of this thematic reference by a square of canvas covered with oil paint. The way in which our attention flips back and forth between the expressive surface (in 2 D) and the thematic content (in 3 D) is guided by our knowledge of the style that makes the pictorial sign aesthetically relevant (scale, resolution, palette, line fractality, light, composition). The network of mental spaces accounts for the composition of our conceptual integration of a complex meaning structure that we experience and evaluate. The same format of mental 'compositionality' may be active in auditively based symbolic structures. In so far, it may therefore be possible to apply this model to musical structure. The results I find are the following unfoldings. 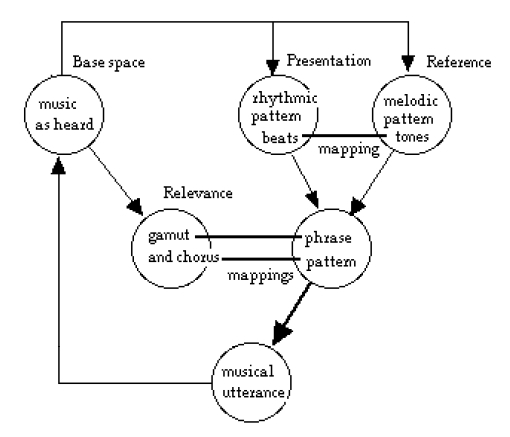 According to this hypothesis, the beats in a rhythmic pattern are mentally mapped onto notes in a melodic pattern, and the 'tonal beats' of the resulting integrated phrase are mentally interpreted by a harmonic and sequential format (chorus) that makes such a phrase and whole series of phrases meaningful, so that they can form an extended musical utterance. Following this analysis, what we hear is mapped onto an imaginary process of possible gestures and more or less culturally coded movements that our body could perform if conditioned by such affective states, given that emotion, motion, and musical patterns may be encoded together. At this stage of integration, the musical phenomenon, affectively invested, is thus mapped onto occurring events in the experiencer's present communitary situation — whether material or mental. This third step uses the same network design as the two first. Through the three steps, the series of integrations form a cascade of integrations, or a blending cascade. At the third level of this cascade, the perception of music acquires a referential content filled by a potential or real socio-cultural context of its performance. As initially mentioned, often there is no such definite, even implicit or potential situation of performance: such underdetermined — ’asocial’ — music is then just perceived as art in its own right, and is probably still interpreted in mental terms of imaginable genres and virtual events. 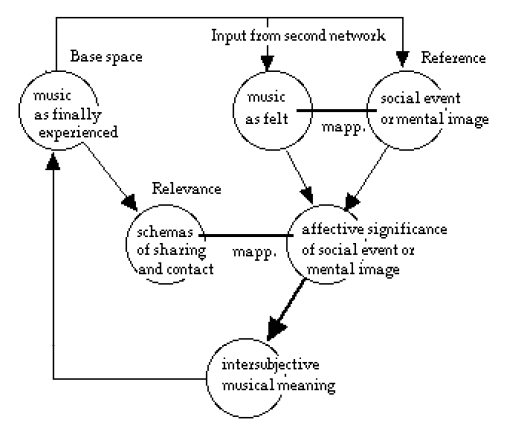 In these cases of globally absent context — cases that were originally marginal, I imagine, but are systematically provided in modern cultures — where music is performed and enjoyed in the absence of any preestablished and significant ’resorbing’ situation, the inherent reference space in the network is simply left open. For most or all music practicians it is characterized by abstract figurations, often synaesthetic sensations, especially of colors and colorful scenarios linked to the tonal entities, and by connected existential thoughts and transcendent feelings. In critics’ and other specialized listeners’ minds, it may be filled by poetic, philosophical or narrative discourse, or rather by discursive intuitions, sketches, and ideas of this kind. The best description of the paradoxical cognitive but non-conceptual state of mind created by forceful musical experiences of this auto-referential kind might be the often heard tautological account: ”It means what it means”. This tautology probably just states that such an impression-of-abstractness is being experienced. In the classical theoretical literature of aesthetics it was called the Sublime (das Erhabene). In this sense, beauty can be said to lead us to the Sublime, which is the Abstract as such. If you will allow me another Kantian expression, it is also the realm of Freedom, in the sense that abstraction is the one operation which in Kant's view frees thought from the local necessities of life. Good art ’lives’ in the sense of an unimpeded embodied freedom of movement: it makes the mind feel openness (Cf. Eco 1962) and ’possibility’ — relieving it from the feelings of immobility: necessity and impossibility, the two modal determiners of misery. This is perhaps the ultimate sense of music as an art form; it conveys a feeling of reality as having a depth of possible paths and meanings. And in its turn, the feeling of reality as such could be a core sense of the term beauty.